December 17, 2013. 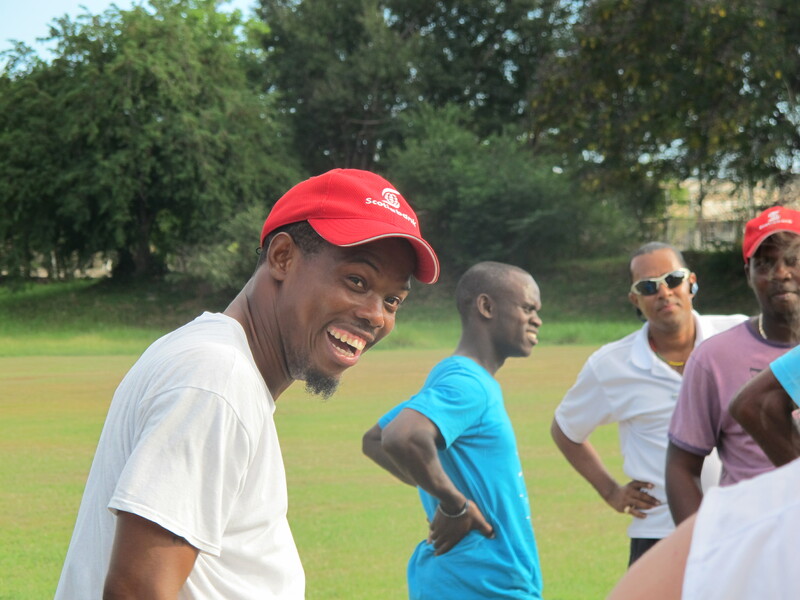 Upon our arrival in Kingston, our coaching team was greeted by Ballaz International and fantastic weather. The CAC-Jamaica 2013 team consists of four fabulous coaches: Staci Wilson, Marc-Anthony William, Anna Rodenbough, and Brian Suskiewicz. Staci, originally from New Jersey, won three national titles at UNC and was a gold-medalist for the USA in 1996. She currently coaches in South Florida and volunteers with the U.S. Soccer Foundation. Marc-Anthony, originally from Trinidad, played collegiately at Denver University and Huntington University, and is a full-time coach in the New York Metro Area. He also coaches with the U.S. Soccer Foundation. Anna, from North Carolina, won two national titles at UNC and currently studies medicine and public health as a UNC graduate student. She previously volunteered with CAC in 2010 in Uganda and Kenya. Brian, as many of you know, is a seasoned CAC vet, having worked in over fifteen countries in the last four years. He is originally from Virginia and played at Boston College before coaching at the collegiate level. Interestingly enough, Staci and Brian were high school classmates at TJHSS&T in Alexandria, VA.
Soccer clearly permeates Jamaican culture, as evidenced by the presence of the honorable Edward Seaga (former Prime Minister) and the honorable Celsa Nuño, the Spanish ambassador to Jamaica who welcomed us and others to her home during the week. In addition to that star-studded evening, all four of us had an absolute blast in Kingston. The community coaches were enthusiastic from the beginning and continually gave well-thought-out answers to every question posed. 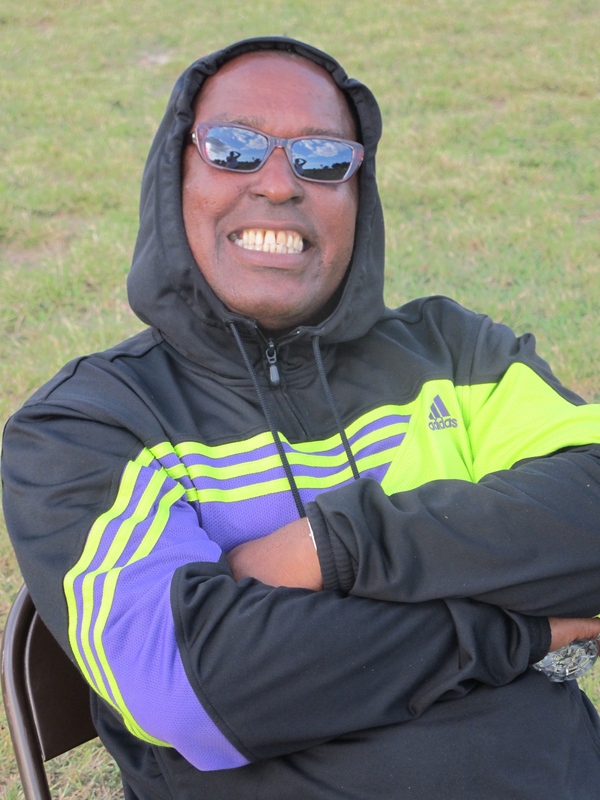 Our daily contact during the week was the affable Coach Sherrick, who went by the nickname “Shrek.” Many of the coaches were from the Ballaz International organization, but several clubs, schools, and organizations in Kingston were represented. 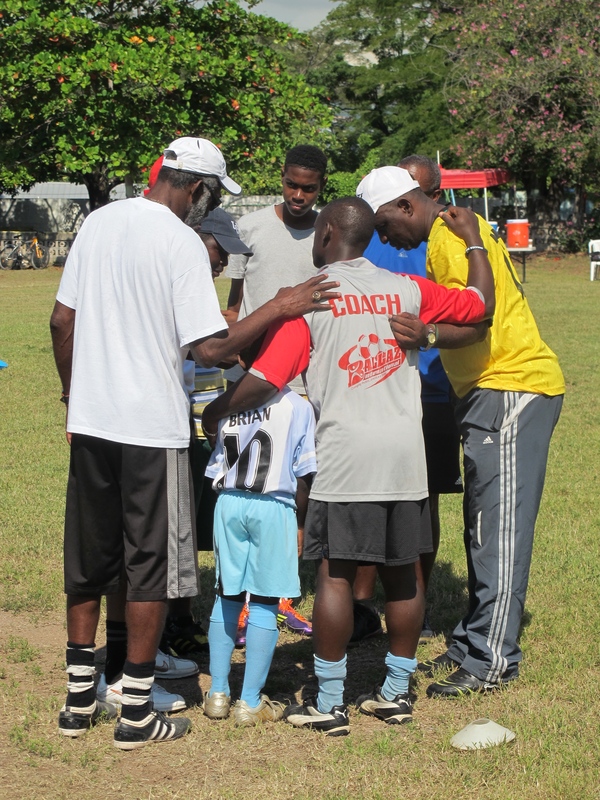 All of the coaches offered valuable social commentary on life in Jamaica so that we could tailor our curriculum to the unique problems facing their communities. 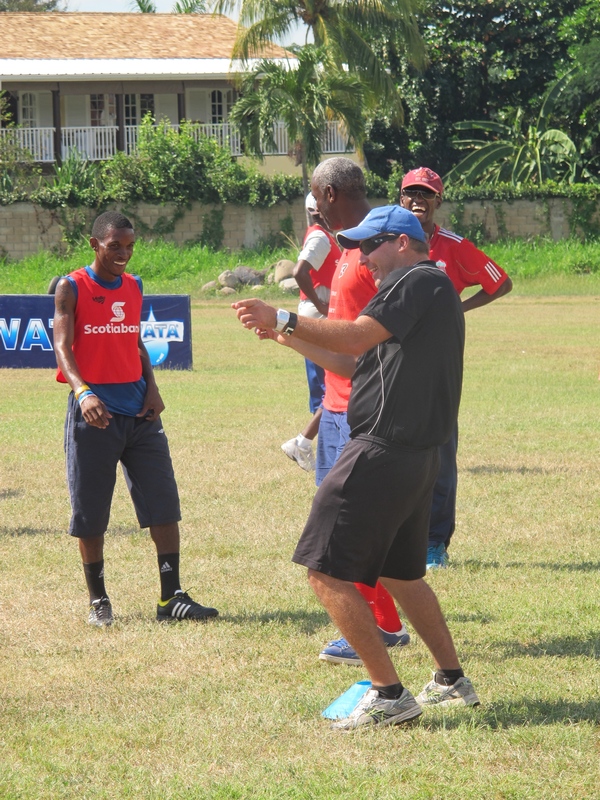 Although we have a fairly experienced bunch of coaches on this trip, we were not only teaching, but also constantly learning from the Jamaican coaches. The highlight of the week was definitely the discussions held by the coaches during our water breaks. 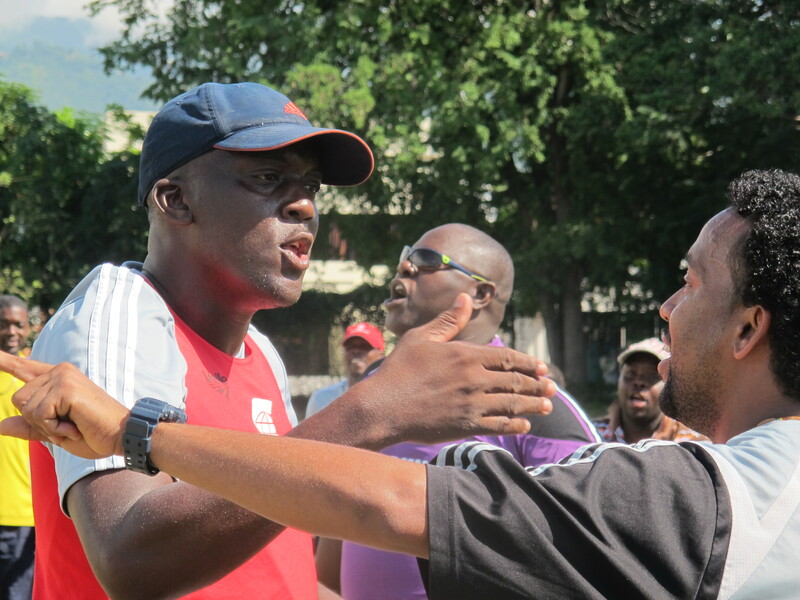 Their insight into Jamaican cultural norms towards gender equity, violence, and other issues were well-taken, and you can see that there is a passion in the coaches when they discuss progress in their society. The next generation also got into the act, as two coaches brought their sons to training on the last afternoon. The messages from our games were immediately picked up by the youngsters, sometimes even faster than their senior counterparts grasped them! The connection between Ballaz International and Coaches Across Continents was made possible by the Spanish-Jamaica Foundation and our trip was the support of many sponsors including Scotiabank, Wata, Island Grill, Hi-Lyte, the Spanish Court Hotel, and Riu Hotels. Our coaching team has been treated very kindly by all of these sponsors, who have provided us with delicious meals and wonderful accommodations throughout our program here. We can’t wait for our second week in Montego Bay! Previous: Congratulations to ISF on their new campus! !